The Israeli occupation authorities on Thursday seized hundreds of dunums of Palestinian land in Dura town, in the southern occupied West Bank province of al-Khalil. Speaking with the Palestinian Information Center (PIC), Dura mayor, Ahmed Salhoub, said the occupation authorities held sway over 292 dunums of Palestinian land in Dura to expand an Israeli settlement illegally built in the area. Salhoub also said the occupation authorities banned the municipality from building a thoroughfare in al-Tabaka village, to the west of Dura, on claims that it is adjacent to the Israeli settlement. The UN on Wednesday warned of the repercussions of the displacement of Palestinian Bedouin communities east of Occupied Jerusalem which are constantly targeted with demolition. This was voiced during a visit by the UN humanitarian affairs coordinator Jimmy McGoldrick and the director of UNRWA's operations in the West Bank Scott Anderson to al-Khan al-Ahmar Bedouin community east of Jerusalem on Wednesday. McGoldrick said during the visit, "We are very concerned about what we see in the vulnerable Bedouin communities," calling on Israel to abide by its legal obligations as an occupying power and stop the demolition of Palestinian-owned buildings. For his part, Anderson said that the humanitarian impact of house demolitions is severe and long-lasting, adding that the deportation of Bedouin communities to urban environments is neither socially nor economically feasible. Al-Khan al-Ahmar is inhabited by 181 Palestinians, 53% of whom are children and 95% are refugees registered with UNRWA. Al-Khan al-Ahmar is one of 46 Bedouin communities in the West Bank threatened with forced displacement. It is also one of the 18 communities included in the Israeli settlement scheme E1 which is aimed at creating a physical link between Ma'ale Adumim settlement and East Jerusalem. Israeli forces on Wednesday issued demolition notices for structures and tents to the south of al-Khalil province, in the occupied West Bank. 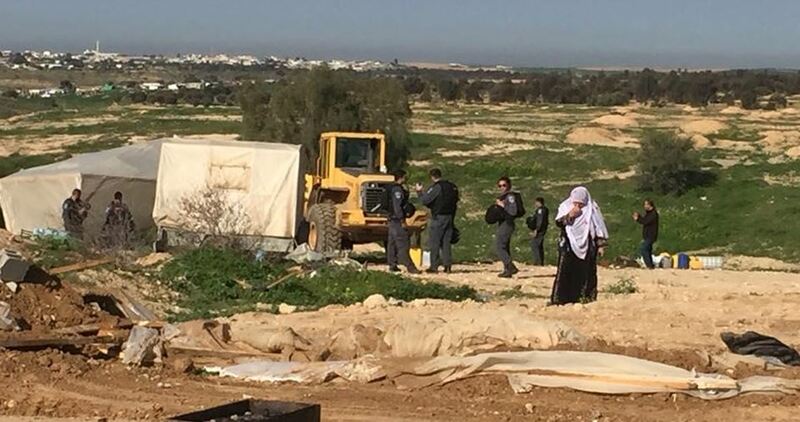 Rateb Jabour, coordinator of the Anti-Settlement Committee south of al-Khalil, said that Israeli forces handed Palestinian families in Ghuwein village, near Yatta, demolition notices under the unlicensed construction pretext. Jabour said at least four demolition notifications were handed over to Palestinians from the Hawamda and Daghameen families. Meanwhile, Israeli settlers attacked farmers and shepherds in Yatta and forced them out of their land under gunpoint. Several Israeli colonizers, living in Yitzhar illegal colony which was built on Palestinian lands, south of the northern West Bank city of Nablus, wrote racist graffiti and cuts many olive and almond trees in Orif village. 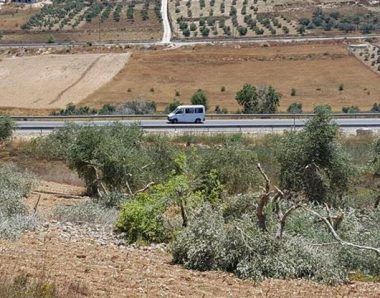 The head of Orif Village Council Mazen Shehada said the Israeli assailants cut dozens of trees owned by Najeh Abdullah Shehada, in Khallet al-Jinan area, south of the village. He stated that the colonizers cut at least 10 olive trees, 10 almond trees and three grapevines. Shehada stated that the villagers, their homes and lands have been subject to escalating assaults and violations, especially since the village is just 200 meters away from the illegal colony. Israeli soldiers abducted, earlier Wednesday, a Palestinian guard of the Al-Aqsa Mosque in occupied Jerusalem and summoned four others for interrogation. 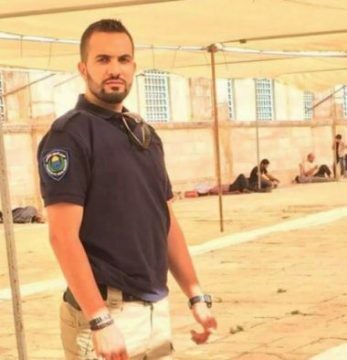 Media sources in Jerusalem said the soldiers abducted the guard, identified as Arafat Najeeb, while trying to enter the holy site through Hotta Gate. They added that the soldiers also summoned four other guards for interrogation in the al-Qashla police station near Hebron Gate, in the Old City. They have been identified as Hamza Nibali, Luay Abu Sa’ad, Khalil Tarhouni and Fadi ‘Oleyyan. In related news, the soldiers invaded Jenin city in the northern West Bank, before storming a blacksmith workshop, and confiscated various machines. Members of the Ruweidi family after settlers take over their homes with the help of the Israeli police, April 8, 2018. Photo credit: the Wadi Hilweh Information Center. Israeli police supervised the seizure, which displaced 13 members of the Ruweidi family. Israeli police assisted colonial settlers seize a Palestinian-owned building in the East Jerusalem neighborhood of Silwan on April 8, 2018. The Ruweidi family lived in and owns the building, which consists of three apartments. Over 13 members of the family are now homeless. 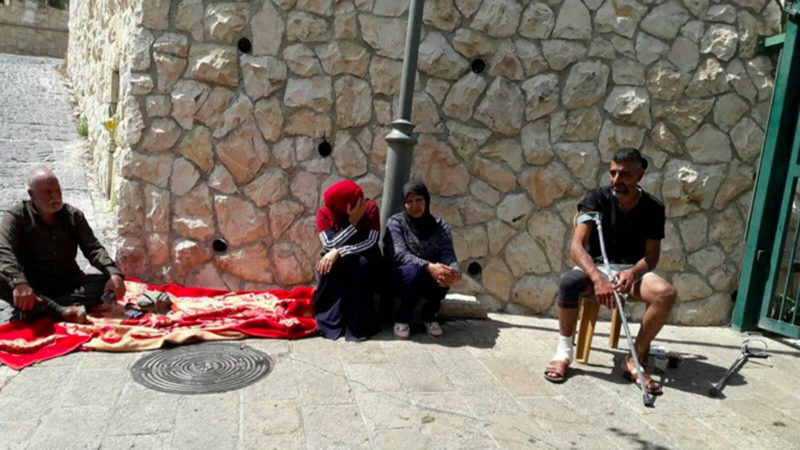 “We are barred from entering [our homes], but the settlers and their guards are inside the houses,” Mahmoud Ruweidi told the Wadi Hilweh Information Center. Prior to the seizure of the building, Israeli police closed the roads leading to it. Israeli forces then confiscated the Ruweidi family’s cellphones and oversaw settlers empty the building of its furniture and change the locks. When members of the family resisted the sudden takeover, Israeli forces responded with physical violence. The Ruweidis’ belongings are now scattered in a nearby courtyard, exposed to the elements. 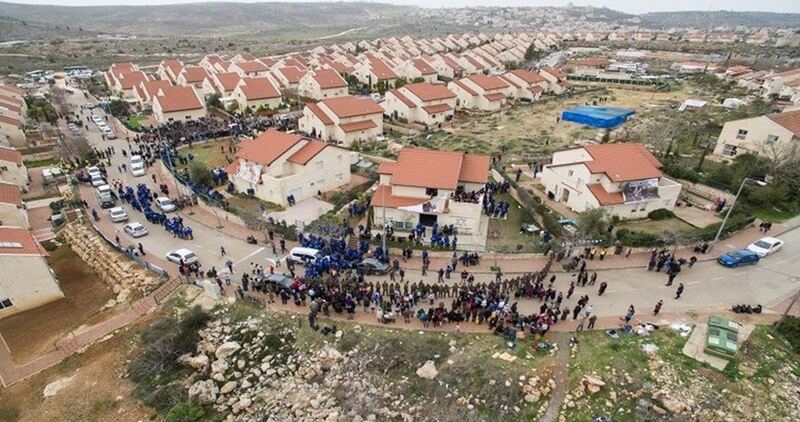 An Israeli court sanctioned the Ruweidis’ forced displacement in February when it ruled in favor of Elad, a settler group that claims one deceased member of the family sold it the three apartments. The Ruweidis appealed the court decision and secured a court order postponing a settler takeover until April 15, 2018. They consequently had no warning settlers would confiscate their homes with the help of Israeli police a week earlier. Israeli settlement watch group Peace Now reports that the police continue to guard the home around the clock while settlers move in furniture. In the last two years, Elad has seized ten Palestinian properties in Silwan. Amalya Dubrovsky is the Editor of aicnews.org. Israeli forces demolished on Tuesday a children’s park near occupied Jerusalem amid a mass escalation in demolitions across the occupied city this year. Spokesperson for Kafer Aqeb municipality, Raed Hamdan, said that the demolition process aims at enlarging Qalandia military checkpoint that links between the occupied city and Ramallah. Erecting military checkpoints is one of the main tools Israel employs to enforce its regime of occupation. Israel imposes restrictions on the movement of Palestinians within the West Bank, and travel between it and the Gaza Strip, into East Jerusalem, Israel, and abroad. 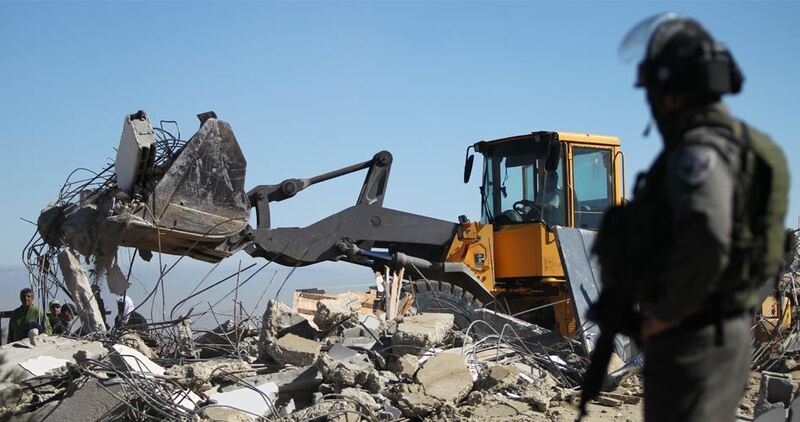 Israeli bulldozers on Tuesday morning demolished al-Araqib village in the southern Negev area for the 127th time. 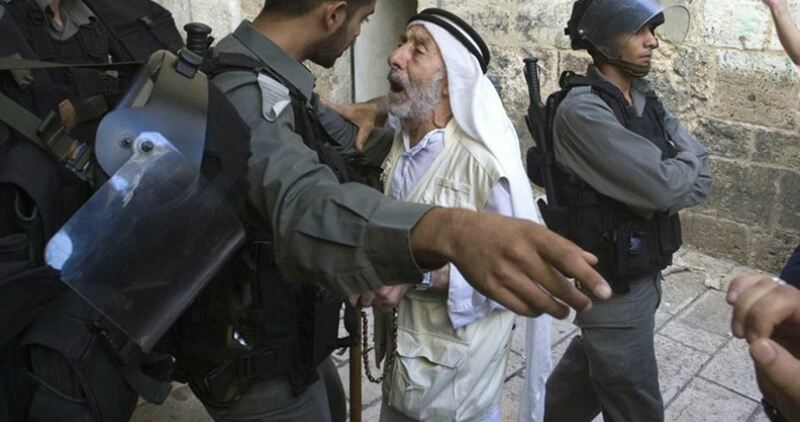 Activist Salim al-Touri said that al-Araqib village has been demolished 127 times since 27th July 2010 under the pretext that its lands belong to the state of Israel. Al-Touri told Quds Press that Israeli bulldozers escorted by a large police force stormed the village in the early morning hours and forced the residents out of their houses. "Israel wants us to give up our lands claiming that they are state-owned lands, but the village was built during the Ottoman era on lands purchased by the village's residents at that time," he added. The last time al-Araqib houses were demolished was on 22nd March 2018. The Israeli authorities are seeking to remove the Palestinian people of al-Araqib from their lands in preparation for Judaizing the area. Al-Araqib is one of 45 Arab villages in the Negev unrecognized by the Israeli government and constantly targeted with demolition and displacement in favor of settlement expansion projects. Al-Araqib residents face the Israeli measures every time with steadfastness and more determination to rebuild their village which has become a symbol of struggle for land and identity. About 240,000 Palestinians live in the Negev Desert. Half of them live in villages and communities established hundreds of years ago. Israel does not recognize these communities, refuses to provide them with basic services such as water and electricity, and cracks down on them in every possible way to push them to leave their lands. Israeli military prosecution on Monday filed a list of indictments against the Palestinian detainee Alaa Kubha on charges that he carried out a deadly car-ramming attack in Jenin. According to the Hebrew-speaking 0404 news site, the list of indictments cited a run-over attack allegedly carried out by Alaa Kubha on March 16 which left two Israeli soldiers dead. The list also included attempts to kill two more soldiers in the alleged attack. The military prosecution ruled for extending the detainee’s remand pending legal and judiciary procedures. During the investigation process and in meetings with his lawyer, Kubha confirmed that the incident, which had occurred near Mevo Dotan settlement, built on Palestinian land in Jenin, was a traffic accident. Kubha told his lawyer that he has been made to endure heavy pressure by the Israeli intelligence so as to force confession and that he has been heavily beaten in Israeli dungeons, where officers threatened to harm his family members, among them his sister, who owns the car. The detainee added that he was brought by force by the Israeli forces to the re-presentation scene, where intelligence officers told him that the Israeli public calls for his execution and for the demolition of his family’s home. They further pledged that the penalty will only include a prison term in case he confesses to the alleged charges. Palestinian activists and civil society representatives rallied on Monday outside the family home of prisoner Ahmed al-Kumba’ to protest an Israeli demolition order. The rally-goers condemned Israel’s demolitions of the homes of Palestinian anti-occupation activists and prisoners as a means to dampen Palestinians’ spirits. 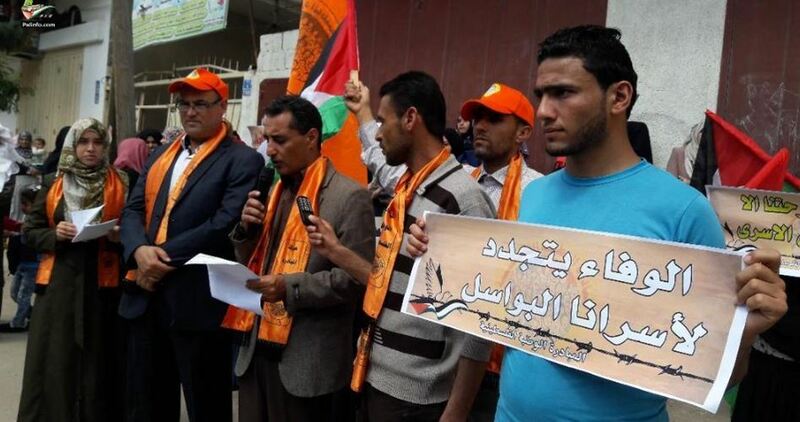 Headmaster of the Amriya School in Jenin, Ashraf Farhat, expressed solidarity with al-Kumba’s family and with the prisoner’s father, Jamal—an instructor at the school. Speaking on behalf of national factions, Mohamed Abu al-Heija said Israel’s policies of collective punishment will never ever dash Palestinians’ hopes for a better future and for the liberation of their land. The Israeli occupation authorities threatened the demolition of al-Kumba’s family home on April 17 on allegations of assisting slain Ahmed Jarrar, who killed an Israeli settler in an anti-occupation attack carried out a few months ago. 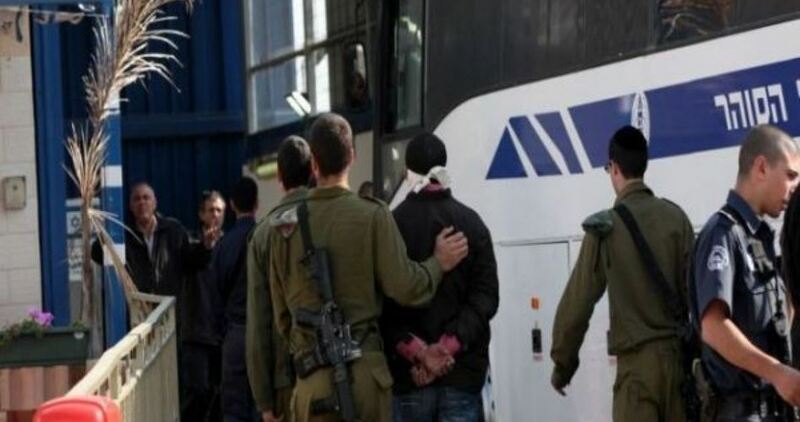 Israeli soldiers abducted, on Monday at dawn, eight Palestinians, and injured four others, during military invasions of Nablus and Jenin, in the northern parts of the occupied West Bank. 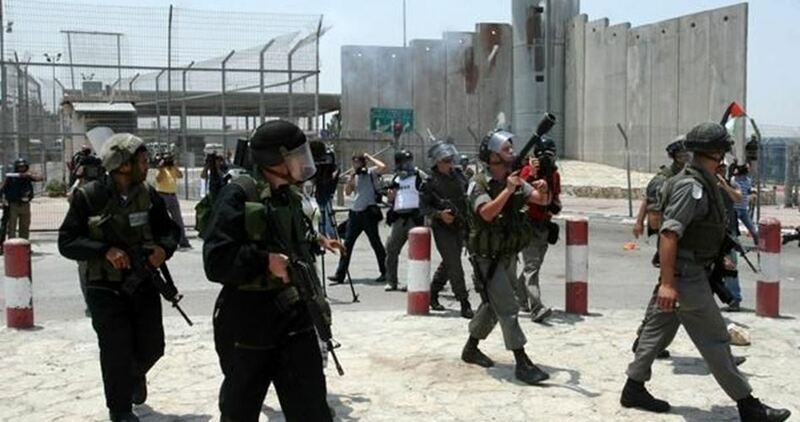 Media sources in Jenin said the soldiers invaded and violently searched many homes in the city, and abducted Mohammad Emad Tazaz’a, Amjad Damouni, Mustafa Kamil Dib’ey and Ahmad Hakim Jamil. They added that the soldiers also invaded many stores along Nazareth Road, north of Jenin, violently searched them and confiscated surveillance recordings. 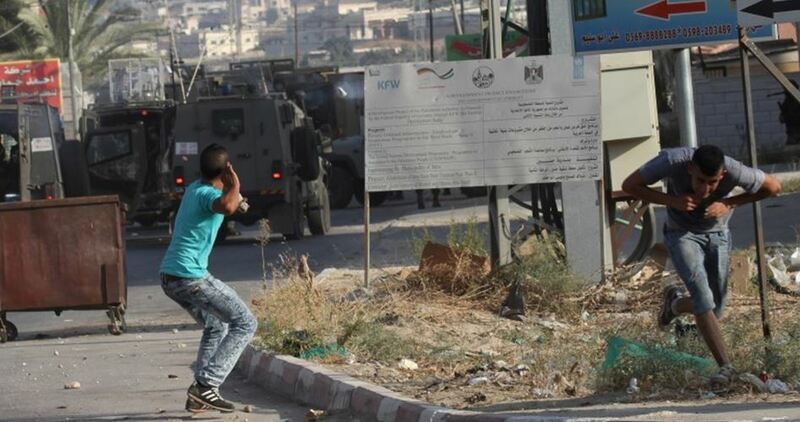 The soldiers also invaded the Shuhada Junction, in the center of Nablus city, and shot five Palestinian protesters, after firing rubber-coated steel bullets and gas bombs at them. Medical sources in Nablus said local medics provided the wounded Palestinians with the needed treatment without moving any of them to hospitals or clinics. During the invasion, the soldiers stormed and searched homes in the Old City of Nablus, and abducted a young man, identified as Ahmad ‘Amira. Another Palestinian, identified as Ahmad Taleb Miskawi, 20, was abducted from his home in Balata refugee camp, east of the city, while Mohammad Mousa Safadi, 27, was abducted from his home in Tal town, southwest of Nablus, and Ahmad Mohammad Shehada was taken prisoner from his home in Jama’in town, south of the city. 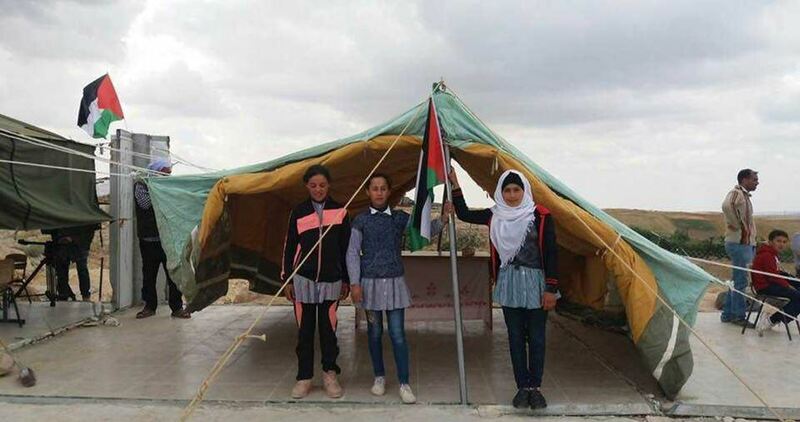 The Israeli occupation forces (IOF) on Sunday night stormed Zanuta hamlet south of al-Dahariya town in al-Khalil and removed tents used as makeshift classrooms for local child students after their school was demolished a few days ago. Local sources told the Palestinian Information Center (PIC) that a military force removed and seized tents pitched in place of Zanuta school, which was demolished and dismantled by the Israeli army a week ago. 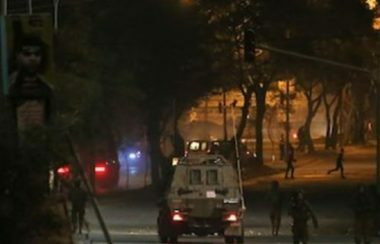 They said that the soldiers forced students and teachers to leave the area and embarked on confiscating the tents. Zanuta residents had to set up tents in the area of the razed school in order to allow their children to continue their education.